Whitten’s surgeon was repeating a long-discredited argument for evolution—the belief that the appendix and many other parts of the body are useless ‘vestigial’ organs, which our evolutionary ancestors needed but which we no longer do. Its greatest importance is the immunological function it provides in the developing embryo. Darwin used the same argument,5 as did the evolutionists at the 1925 Tennessee Scopes trial.6 Millions of people have abandoned faith in the Bible influenced by such arguments—arguments which are themselves ‘vestigial’, the vestiges of supposed truths that, when used today, are useful only to mislead. At the time of writing, Richard Wilkinson, B.Phil., was a magazine, newspaper and book journalist. He lived in Washington, D.C., and edited faculty and alumni magazines for universities. Return to top. The last word, New Scientist 177(2381):65, 8 February 2003. 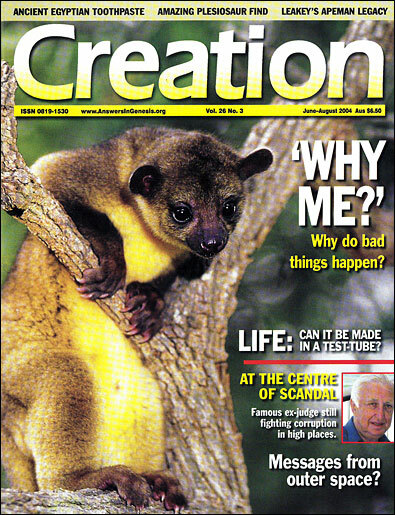 The question (with name) first appeared in the 12 October 2002 edition. Return to text. The 15th edition, 14:959, 1992, included the appendix in its list of ‘more than 100 such organs’. Return to text. It is, in any case, impossible to prove that an organ has no function; we may merely be ignorant of its function (see reference 6). Return to text. Storer, T. and Usinger, R.L., Elements of Zoology, McGraw-Hill, New York, USA, p. 208, 1977; cited in Bergman, J. and Howe, G., ‘Vestigial Organs’ Are Fully Functional, 2nd edition, Creation Research Society, Missouri, USA, p. 7, 1993. Return to text. Darwin, F. (Ed. ), The Life and Letters of Charles Darwin II:9, D. Appleton and Company, New York and London, 1911. Return to text. In the early 20th century, evolutionists often claimed that literally dozens of parts of the human body (tonsils, parathyroid, etc.) were useless, vestigial organs. Virtually all of those body parts are now known to carry out important functions. Return to text.